WASHINGTON (AP) For all the good Erik Spoelstra saw from his Miami Heat at the defensive end – building a 25-point edge, holding the Washington Wizards to 29 for a half, shutting out a hobbling John Wall until there were 5 1/2 minutes left in the game – they still barely held on for a victory. ”It was pretty harrowing,” the coach said. 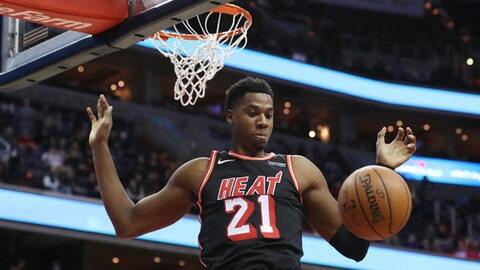 The Heat let their lead dwindle all the way down to one before holding on for a 91-88 victory over the Wizards on Friday night, led by Hassan Whiteside’s 22 points and 16 rebounds and one very key 3-pointer with under a minute to go from an ill Dion Waiters. James Johnson scored 20 points for Miami, and Waiters had 13, most importantly the late shot from behind the arc that made it 89-83. That was how Washington’s Bradley Beal felt. He answered Waiters with a 3 of his own, then had a chance to win the game or tie it, holding the ball as Washington trailed 90-88 in the closing seconds. Beal appeared to have an open 3, but he instead took a 17-footer that missed. ”Still debating in my head if I should have shot the 3 or if I should have went to my step-back or whatever,” said Beal, who finished with 26 points and 10 rebounds. The Wizards entered with a four-game winning streak, including a victory at Miami on Wednesday night. But they go as Wall goes, and the All-Star point guard wound up with only eight points on 3-for-12 shooting. He said his left knee was sore, and he was limping in the locker room afterward. Wall wasn’t 100 percent certain he’ll be able to play in Washington’s next game. Overall, the Wizards made 38.1 percent of their field-goal attempts. Still, the hosts got within 89-88 on a pair of free throws by Otto Porter Jr.
Johnson then made one foul shot with 6.5 seconds left. After Beal’s miss, Miami tacked on a free throw. Washington entered Friday averaging 110.7 points, fourth-best in the 30-team NBA, but this one was different right from the get-go. The Heat led 26-17 after the first quarter, when Washington made only 6 of 20 field-goal attempts, including 0 for 6 on 3s. The go-go attack steered by Wall was outscored 9-0 by Miami on fast breaks in that period, when Wall, Beal and Porter combined to shoot 0 for 8. In contrast, that trio provided 65 points and 24 rebounds in Washington’s victory at Miami the other night. Heat: Spoelstra pulled F Justise Winslow just a minute into the game after the man he was guarding, Markieff Morris, scored two quick baskets. Wizards: Still have not defeated the same opponent in consecutive games in nearly four full years; the last time was Dec. 28-30, 2013, against the Detroit Pistons. Heat: Host Indiana on Sunday. Wizards: Open a three-game road trip at Toronto on Sunday.